Amazon – one of the biggest e-commerce giant has once again proved that it is always ready for innovation. This time they have introduced a new feature known as AR View which will allow customers to visualize the products in their own living space. Amazon has launched this new feature in its iOS app. Currently, AR View supports a wide range of products from various categories like electronics, furniture, home decors (with more to be added soon). There are other apps with AR feature but they only support selected categories like furniture. But, AR View supports a wide variety of products which means that customer can make a better choice before buying anything. AR View is built using Apple augmented reality framework ARKit. AR View can be found on the camera icon in the Amazon iOS app, which now has a new "AR View" option. This feature will be available for all the iPhone users with iOS 11 installed on their iPhone 6s or higher version. Apple released ARKit back at its WWDC conference this year. Since, then there have been many developments in the field of AR (with the release of apps like ARRuler, IKEA Place). According to many companies, AR has the potential to change the customer's behavior of shopping. AR feature is expected to add a new dimension to online shopping as now users can actually see and feel how the products look like before placing an order. 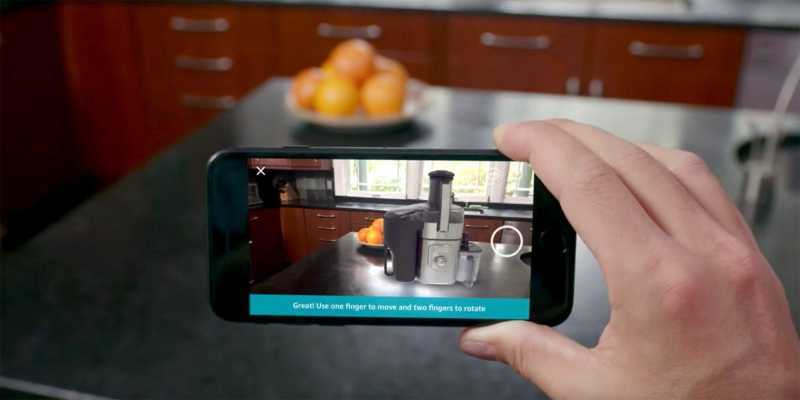 A large number of retailers have also added AR shopping feature to their website and app (including IKEA, Target, Wayfair). The best thing about ARView is that is super easy to use. Just open the Amazon app and tap at camera icon. Now you will have to choose ARView option and then you swipe through various products. You can also rotate the items to see them in full 360-degree view. Yes, this feature might be helpful for small products like groceries, daily need items. But it will certainly have a large impact on some product categories like furniture, home décor. Amazon might have come up with ARView feature but it is only limited to iOS users. It remains to be seen when Amazon adds the support for Android devices.